In recent weeks, as I look at pictures and listen to stories about the devastation caused by Harvey and Irma, I can’t help but think back to a similar time when the hurricane names were Katrina and Rita. This is not a story about the heroic efforts or terrible deaths that accompanied those events, but a little-known tale about how the government and industry were able to work together in an unprecedented manner to respond to a catastrophic event that none of the people involved had ever experienced. Murphy’s Law tells us that all events of this nature begin on a Friday afternoon. Katrina was no different. 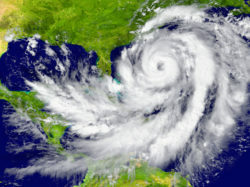 As I left work on Friday August 26, 2005, everyone was aware that a large hurricane was approaching the Gulf of Mexico, and normal hurricane procedures were being put into place. But as the weekend progressed, Katrina kept getting larger and larger. I remember looking at the weather channel Sunday afternoon and Katrina seemed so large that it covered the entire Gulf of Mexico. Katrina hit on Monday, August 29 and the extent of the damage was beyond anyone’s expectations. Far away from the storm, in my office at Marathon Petroleum Company in Findlay, Ohio, I watched helplessly as report after report told of the damage and deaths. On the morning of Wednesday August 31, I received a call from Margo Oge, the head of EPA’s Office of Transportation and Air Quality. She wanted to know how the supply of gasoline and diesel would be impacted by the storm. I told her that supply would definitely be impacted, but at that time no one had any clue how long it would take for the damaged refineries to get back up and running. Her staff had already given her the names of contacts in other refining companies, but I suggested that she also talk to some pipeline contacts. The next day she set up a conference call with all those contacts, and on that call each company representative candidly summarized the status of their impacted facilities. These were not typical problems; we had control rooms filled with mud, and places where the alligators had to be removed before damage assessments could begin. Many of the people providing the information and planning the repairs were sleeping in the refinery because they had no homes to go home to. On this conference call, we also began to talk about what actions EPA and the states could take to help the situation. Any truly business-confidential information was discussed one-on-one with EPA representatives on a separate call. These conferences calls continued on a daily basis following Katrina, and while the development of solutions was anything but a smooth process, all the parties involved attempted to be frank, honest, and cooperative. With the information gleaned from these conversations, EPA waived the ozone season RVP requirements through the end of the summer ozone season and beyond, and terminal tank emission limits were also waived temporarily. In the aftermath of the storm, EPA worked with industry to convince the states to grant reasonable waivers. Government agencies even decided to divert a large emergency generator to a pipeline facility so that the pipeline flow could be re-started as quickly as possible. Two weeks after Katrina, when we were discussing discontinuing the daily calls, hurricane Rita hit Texas and Louisiana, and the team that was already in place continued on. The daily meetings continued through the end of September. Six months later, as part of an after-action analysis, the parties involved in these daily calls discussed how to set a permanent team to handle this type of response effort. Unfortunately, both EPA’s and energy industry lawyers concluded that it was both illegal and inappropriate for EPA and the industry to openly share the operational details that were discussed in those daily meetings after Katrina. In spite of this, I find it reassuring to know that when disaster strikes both government and industry can bypass restrictive rules and work together to fix serious problems. I commend Margo for her willingness to take unprecedented steps to solve a serious supply problem following hurricanes Katrina and Rita.